Ah, photo management. How I love, er, hate...okay. I love photos, but HATE keeping them organized. Fortunately, technology makes photo management much easier, you just have to know where to start. That's often the hardest part, and that's what we aim to accomplish with these 7 great tips for digital photo library management. First things first. Use a photo management app. If you only read one part of this page, this is the one to read. A good photo management system will make or break your efforts to manage your library. There are many photo management apps and applications out there, with a lot of different features. The features you need - and don't need - are truly a personal preference. Within the "photo management" arena, I see 2 types of tools. The first group is more "family-centric" and focuses primarily on photo management and sharing. You can view photos, create albums and share with others. These will sometimes have basic editing abilities. 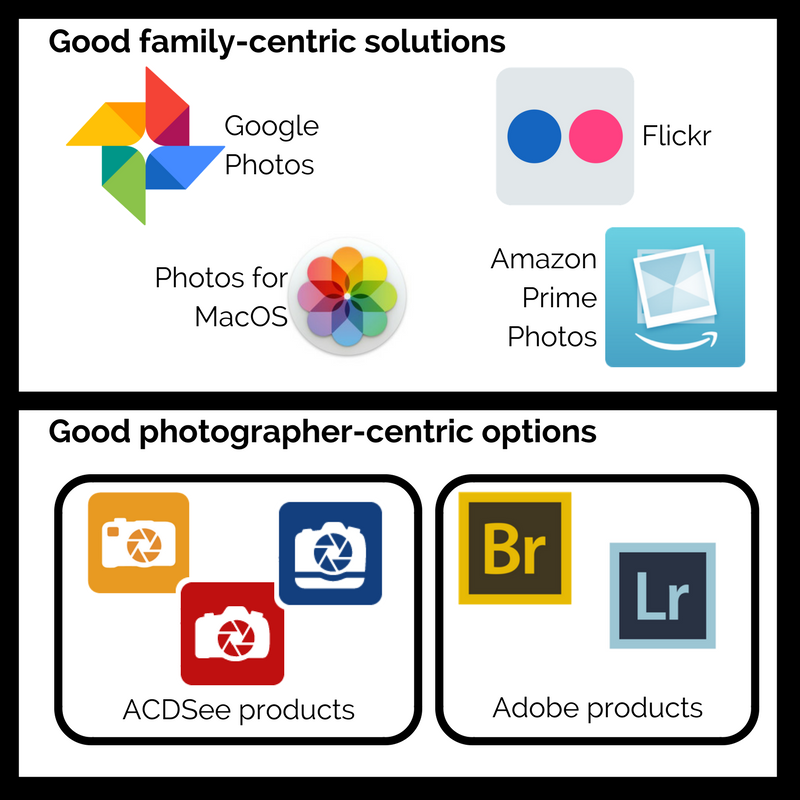 Good examples of these include Flickr, Google Photos or Photos for MacOS (Photos for MacOS sort of works in both areas. It's only available for Apple products). These types of services are usually free. The second group is more "photographer-centric" and focuses more on photo editing while still offering (sometimes) great sharing abilities. Examples of these would be Adobe Lightroom and Bridge CC (you could also argue for Photoshop) or ACDSee applications. Expect to pay for these products. Which type is right for me? Which specific product should I use? If you are looking for a simple way to preserve, share and relive memories from your photos, and are not so concerned about always having high-quality photos in your library, choose something in the family-centric group. If you would define yourself as a photographer - be it professional, enthusiast, beginner - and want to have only the best looking photos in your library, or if you refer to your library as a portfolio, go with that group. At Legacy Tale, we focus on helping families preserve memories, so the first group is more our focus. 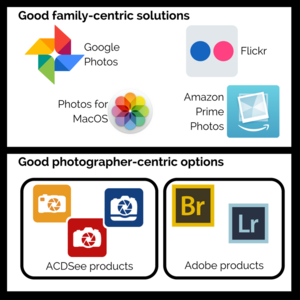 Some of the biggest and best known options in the photo management space include Prime Photos from Amazon, Flickr, and Google Photos. Which is the best for you? Since most are free, don't be afraid to install and test them. Flickr and Google Photos are free, while Amazon Photos is included with a Prime membership. Since most people buy Amazon Prime for the free shipping, extras like photo storage can be seen as "free." The ability to save photos with lossless (or very near lossless) compression. Lossless is a technical term - it basically means not losing photo quality when a photo file is compressed. Machine learning that does a good job of organizing photos for you. Creating albums and sharing albums (as well as individual photos) should be easy to do. While all of the previously mentioned apps are good choices, for our money, none is better than Google Photos. By the way, Google Photos is free, so our money gets to stay in our pocket. Google Photos meets all four bullets above. It has many features and Google regularly adds more. As far as organization goes, it does almost all the heavy lifting for you. It organizes by people (using facial recognition), place (for original digital photos with a location tag), objects and of course time and date. Album creation and sharing is simple. It also creates recommended albums, and recommends people to share with. Details associated with your photos can be included in the description field (further explanation in the "Include details" tab). Google's compression algorithm is virtually lossless. With mobile apps for Android and iOS, as well as a web portal, you can access your photos from your phone or computer. The hardest part is just beginning. If you're like most people, you have hundreds, maybe thousands of photos and no organization system. Decide to find a photo management app/system, and put it in place. Then start your photo organization project. Printed photos will break down over time. There is also the risk of losing them and not being able to replace them. Up until a few years ago, a flatbed scanner was the only way to digitize printed photos and have consistently good-looking results. But phone cameras and apps have made huge advances in the last few years, so while you can still use a flatbed scanner, it's not really necessary. You don't want watermarks. If you pay for an app, that shouldn't be a problem, but free apps may add their logo as a watermark. Test one before doing large batches of photos. Integration with the cloud storage of your choice. Whether you use Dropbox, iCloud or another, the easier it is to scan then save photos, the quicker the project will go. While there are many scanning apps available, we prefer Google PhotoScan for photos. PhotoScan takes multiple pictures and renders one digital picture. The advantage to this is it can "fix" small imperfections, glare, etc. Don't worry, the time it takes to snap those extra pics is about as long as it would take to do a single scan. It also saves directly to Google Photos so you can scan and share quickly. Here's a little bonus. You will often have documents (i.e. birth certificates, diplomas, etc.) you want to preserve. For that, we recommend CamScanner. CamScanner will scan documents and save them as searchable pdf files. Keep in mind that the free version adds a CamScanner watermark at the bottom right corner of pdfs. Both of these are available for Android and Apple devices. We keep photo libraries because images are powerful ways to remember. However, all memories fade with time. So managing a photo library is also like managing a memory library. Details and stories need to be written or otherwise recorded and kept with the photos. Names and dates of people in the photos are important basics to include. Additionally, a brief synopsis of what's happening, the event or occasion, etc., is also fairly standard. Don't forget to include the details you want to remember, though. While right now everything may be fresh in your mind, remember that those memories will fade with time. If it's something you don't want to forget, make sure it written down. There are several options. One is within the photo metadata (2 tabs below). Other options include within the photo manager app you should be using; most photo managers offer somewhere to add a description. You could also use any word processor-type application (I wouldn't recommend this - you still have the issue of tying the picture file to the story/text file). Other apps like Evernote would work well for this. The easiest and safest methods are to use either the metadata or the "description" feature within the photo management app. But know which one you are using before you start, then stay consistent. While you would think that the "description" field in a photo management app is tied to the Comments field of the metadata, that is not always the case. Back in the olden days - like 2010 - the fancy way to manage a photo library was on your computer. The most common method was to have a pictures folder. On the first level was the year. Inside the year folder was a month, and in some cases within the month were all the days of that month. Keeping this organized all in one place was tedious. Sharing photos was time consuming and bandwidth intensive. Heaven forbid your hard drive failed. If it did and you didn't have a backup, everything was lost. By storing data in a secure datacenter - often called "storing in the cloud" - you keep your data secure, backed up and available from anywhere (with an internet connection). There are many good services to choose from including Dropbox, iCloud, OneDrive and Google Drive. Pick one and put things there. You don't need to worry about keeping a separate backup on a USB drive; so long as the Internet exists - and you use a reputable company - no storm, hardware failure, natural disaster or even war can cause your photos to be lost. If you are using a photo management app that syncs between your phone and desktop, then you are using some sort of cloud storage already and don't need to worry about finding a cloud storage space. If you're using a photo management product like Google Photos or Amazon Prime Photos, you don't need to worry about metadata. Metadata includes a lot of information that most people don't care about. However, you can use the comment field of a jpg (the most common photo file format) to tell the story of the picture. There is no character limit, so you can be as detailed as you want. Just remember that when you upload a photo to most social media channels, the metadata is NOT retained. It will still be there with the original file, just not for others you share with. It also may not be retained with the photo management option you use. There are a number of ways to view the metadata (also called EXIF data). In Windows, right click the file, select properties, then the details tab, and the metadata will display. For a Mac, open Photos, select the picture and hit Command + I (that's the letter "i"). There are other options too. You can use online tools like VerExif.com, browser plugins like Exify for Firefox or Exif Viewer for Chrome, or you can still install an application on your computer (like Exif Data Viewer or Simple Exif Viewer for Mac OS). If you're really into metadata (or want to get into it), look into these options. For most people who want to see all the metadata, I recommend just using the properties window (for Windows) or the Photo application (for Mac). I think we all do this now: When we take a picture with our phone, we don't just take one. We take several. The thinking is sound; by taking multiple photos of one scene, we have a better chance of getting a "great" picture. The problem is, we don't always go back and delete the "bad" photos. This clogs up our library with duplicate photos (essentially). It also takes up space on our phone. Have you ever run out of storage space on your phone? It's just terrible. In fact it may be one of the more terrible first world problems that exist (Ha-Ha). So the next time you snap photos, take a few seconds (that's really all it takes) and look through your camera roll. Pick the best one and delete all the others. What about all the existing photos you have? No doubt there are photos there to delete. It may take a while, but using a photo management program will make it much quicker. You can usually see all the photos, then select multiple photos and delete all with one click. What constitutes a bad photo? ​If it's blurry or too dark to see what's happening, or if you have no idea when or where the picture was taken, it may be worth deleting. Before doing so, you can ask someone (or several someones) if the photo means anything to them. In our work with people telling their life stories, we've seen dark, blurry photos that appear worthless. But the person who took the photo remembers exactly why they took that photo and its significance. That's why capturing the stories behind photos is so important. Wait, I thought this was about digital preservation? It is, but there is still room for printed photos, especially if they are in a nicely bound book. There are many options to choose from like Shutterfly, Blurb, and even Google is getting in on the act now. While photo management apps and cloud storage make it easier than ever to share photos - they're especially great if you're sharing with friends and family who live far away - there is still something about a physical book you can hold and look at with other people. Our family likes to make annual photo books, as well as vacation or special occasion photo books. If you've ever made a photo book using one of the aforementioned services, you know that it is fairly time consuming. In fact it is a labor of love, which is why we only do the ones we do. Having these photo books is a great way to not only preserve those memories, but to relive them. Set them on the coffee or end table and people will pick them up and look through them. They are a great way to relive memories, strengthen friendships and even shorten (or end) fights. When you make photo books, limit the scope. If it's for an entire year, include just the highlights. If it's for an event, vacation or special occasion, limit the book to just that. Hopefully these tips give you some new ideas and/or motivation to get organized. While it does take a commitment to get and keep your photo library organized, it's not nearly as difficult as it used to be. Still have a question? Scroll to the bottom and click the "Contact Us" link. We'd love to help you make and keep memories. There are many ways to manage your photos, but Google Photos rules them all. Want to learn more about making, recording and managing your family and personal memories? Sign up for our free newsletter and get exclusive content, discounts and expertise.